U.S. Senate candidate Roy Moore greets supporters before speaking at a campaign rally, Dec. 11, 2017, in Midland City, Ala.
Voting is underway in the southern U.S. state of Alabama in a tightly contested Senate election between Democrat Doug Jones and Republican Roy Moore, a campaign roiled by charges from women who accused Moore of sexual misconduct four decades ago when they were teenagers and he was in his 30s. Tuesday's special election was being watched nationally, both as an indicator of how midterm congressional elections might play out next November and also as a barometer of President Donald Trump's political clout. Trump endorsed Moore, who has denied the women's allegations, and called for the defeat of Jones, whom he said would be a political "puppet" of liberal Democratic lawmakers in Washington. The election winner will serve the last three years of the seat left vacant by Jeff Sessions when he joined Trump's Cabinet as attorney general, the country's top law enforcement position. If Moore wins, Republicans will retain their 52-48 majority in the Senate, but a Jones victory would pare the margin to 51-49, possibly further complicating Trump's efforts to pass his legislative agenda. Pre-election polls at various times have shown both Moore, 70, and Jones, 63, in the lead, but the history of elections in deeply conservative Alabama runs against Jones. No Democrat has won a Senate election in the state since Richard Shelby did in 1992, and two years later he switched parties to become a Republican. Still a senator, Shelby said Sunday that he voted absentee for "a distinguished Republican" as a write-in choice, but could not bring himself to vote for Moore after one woman, now in her 50s, said Moore abused her when she was 14. Moore, twice deposed as a state Supreme Court justice for failing to follow federal court rulings, has accused journalists, Democrats and establishment Republicans in Washington of trying to undermine his campaign. Some Republican lawmakers, a number of whom said Moore should drop out of the contest after the women's allegations surfaced, said they would try to expel him from the Senate if he won. Quinnipiac University said its latest national poll showed that Americans, by 60 percent to 31 percent, said the Senate should vote to expel Moore if he won the election. By a wide margin, 63-21, voters disapproved of Trump's endorsement of Moore, the poll said. As he voted, Jones said, "We feel very good about where we are in this racewhat we've done and what we've accomplished. 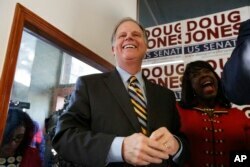 "The things that have been said to us in this campaign are extraordinary," Jones said. "The number of 'thank yous.' The number of 'God bless yous.' The number of 'We are praying for yous.' This is an important time in Alabama's history and we feel very confident in where we are and how this is going turn out. But more important, we feel so good about what we've done and what we've said to the people of Alabama and the people of the United States. So, thank you." Moore, at his final rally Monday night, again denied the women's allegations, calling them "disgusting," and vowed to help Trump disrupt politics as usual in Washington.